A great early example of satirical mapping. The use of the shapes of various countries has long been the inspiration or basis for making maps and produces interesting curiosities that match familiar shapes with familiar imagery. This example by Robert Dighton, the well-known !8th century painter and published by Bowles and Carver, was one of a series including England, Wales and Ireland that received similar treatment under the title “Geography Bewitched”. 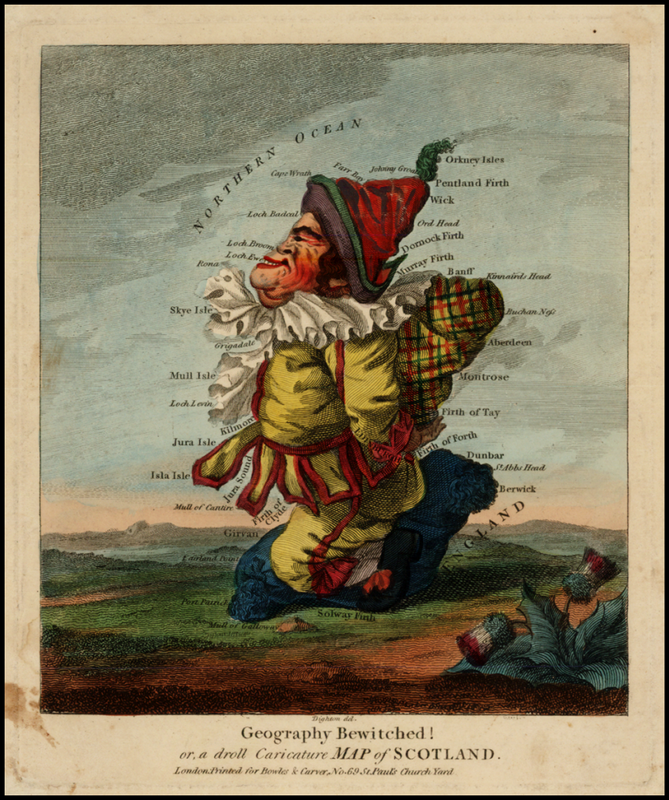 The map is titled “a droll caricature Map of Scotland” and shows a stereotypical Scotsman in what resembles national costume. Hand coloured, the map positions the character on a landscape complete with Scottish thistle. This style of mapping has been used to good effect in newspapers and cartoons and are particularly collectable. In terms of design, the artist makes excellent use of the shape of the country in which he fits the caricature. Here, the shape of the map is intrinsically linked to the intended output but supports the general principle of ensuring the map-maker considers the map shape and how it underpins the shape and layout of the overall map page. This entry was posted in MapCarte and tagged artistic, MapCarte, satirical by @kennethfield. Bookmark the permalink.